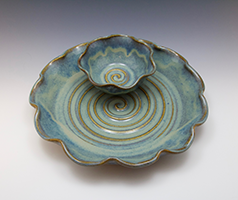 Wendy has focused her passion on artistic and functional wheel-thrown and hand-built pottery for over 20 years. Her pieces express a simple and delicate touch reflective of the very earth from which they are shaped. Wendy received her formal training in ceramics, and studied many artistic forms including photography and oil-on-canvas while earning her Bachelor of Fine Arts degree at the University of Denver. Wendy continually refines her skills at workshops and conferences around the country. Her award-winning work has been exhibited in juried shows in California and Colorado. 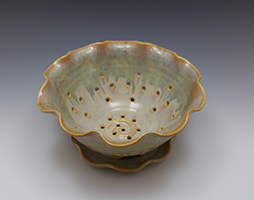 As a member of the Genessee Valley Art Co-op, Wendy founded WLR Pottery in 1995 (under her maiden name Radtke), and began displaying her work in galleries in the Finger Lakes Region. She has exhibited in events across the country including the Lilac Festival in New York and the popular Health and Harmony and Apple Hill festivals in California . In Colorado, she has participated in the Holly Berry House Folk Art Festival and has been a member of the Pikes Peak Studio Tour. Wendy’s studio is located in the beautiful foothills of the Rocky Mountains in Colorado Springs, CO.